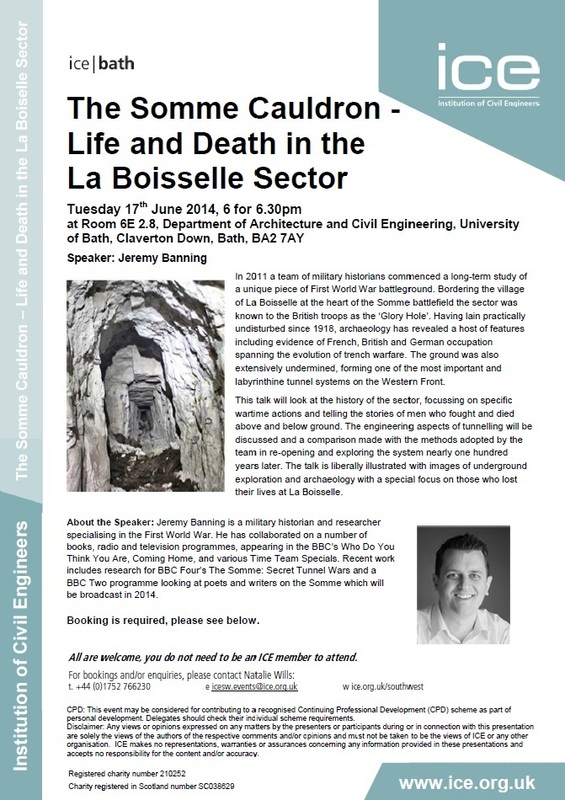 On Tuesday 17 June I will be speaking on “The Somme Cauldron – Life and Death in the La Boisselle Sector” at the Institute of Civil Engineering, University of Bath. Doors open at 6.00pm for a 6.30pm lecture start. Tickets are free – but limited in number – so please book ahead to ensure your attendance. This entry was posted on Tuesday, March 25th, 2014 at 9:47 am	and is filed under Talks and lectures. You can follow any responses to this entry through the RSS 2.0 feed. You can leave a response, or trackback from your own site.